Latest figures released by the government suggest the new National Olympic Stadium will be roughly 50% cheaper than in pessimistic estimates. However, it's still top of the most expensive stadium list. Tokyo governor Naoki Inose informed the press on Friday that building the futuristic National Olympic Stadium in Shinjuku Ward is now expected to cost ¥148 billion ($1.5 billion). That's only a slight increase since the very earliest estimates of ¥130 billion and over twice less than pessimistic predictions of ¥300 billion. However, additional cost will be generated by redevelopment of direct surroundings of the stadium. Totalling at ¥37.2 billion, construction work in the surrounding areas includes ¥26.6 billion for artificial foundations, ¥3.9 billion for building a park, ¥3 billion for creating access routes and ¥2.6 billion for relocating the local water supply and sewage system. When comparing the stadium itself to other large projects worldwide, it's the second most expensive stadium ever, just behind MetLife Stadium in East Rutherford. 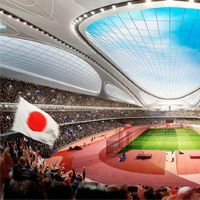 However, should we count in the infrastructure cost too, Tokyo's new stadium is still the most expensive in history, despite cost-cutting measures.